As the month ends tomorrow, I though I would make a little list of all the (beauty related) things I want to buy this coming month. R-L: L'oreal caresse lip stain - Models OWN lip crayon - Benefit eye primer - Marc Jacobs Daisy - Models OWN 5 P brush set - BLUE Q airmail pouch. l'oreal caresse lip stains: I've been eyeing this for a few weeks now, but as in the store where I buy my Loreal products there are no testers, I had to do a little online research to see what shades I liked the most. And the winners are: Stay Lilac ever after, and Rose on and on. Benefits Lemon Aid eyelid primer: I'm on the search for the perfect eye primer, and after reading a few reviews, I think I've found the one I like. The only problem (sort of speak) is that its a bit on the pricier side (£16 in ASOS), I'm a drugstore makeup kinda gal, and I don't know If I feel like splurging, specially because If I get it online, there is no way of testing the product. Models OWN neon brushes: I'm in the need of some travel brushes as I'm going on a short getaway in a week or so, and this are sooo cute I couldn't resist. Blue Q Postal pouch: I also so this beauty in ASOS (I'm an ASOS addict and I'm in no way going to rehab), and I thought "perfect for a makeup bag!" and oh so cute! Marc Jacobs Daisy Eau du Fresh: This coming month is my BDay and I've gotten the little habit of gifting myself a perfume every year (oh how I love me!). This year, I think I'm going to go for this lovely one, I tested it and I can't stop thinking about it. As most of my perfumes are strong scented, so this fresh fragrance will come in handy for spring. Have you tried any of this products? I would love to hear you opinion!! GREAT POST! Really like it. I am about to follow you, maybe you could head over to my blog and follow me too? I have an upcoming post about the Lush event I went too! PS- Love the design of your blog. thanks lovely! sure thing, lets follow eachother! I definitely think the Marc Jacobs Daisy perfume is a good choice -- it's nice and floral. It's on my wish list too! I haven't but thank you for sharing! I really like your blog by the way, followed you on bloglovin, maybe follow me back? Thanks for the comment on my blog. I thinks those lip crayons look great, fantastic picks. Love your blog! 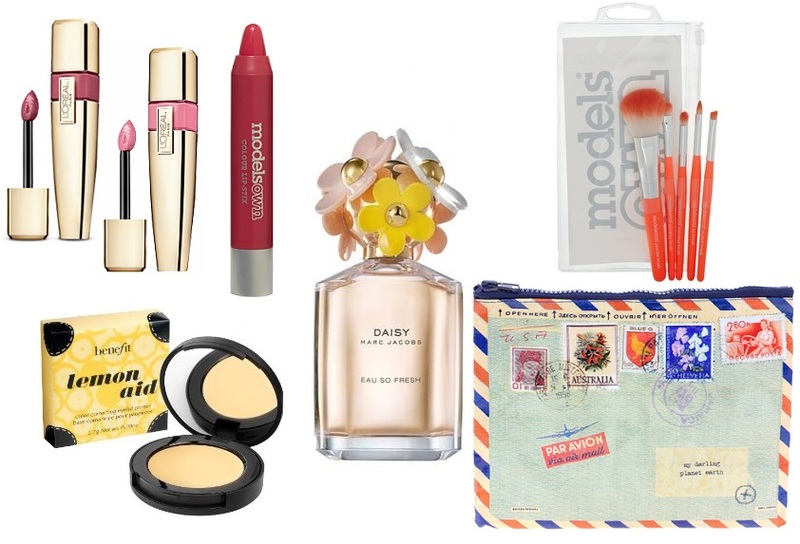 Great wish list, I want the perfume! Those lip stains are so pretty! You're right, the Marc Jacobs perfume is gorgeous, I love it! Hi Laura! Thank you for coming by my blog and your kind comment! You have some great picks here- the only one I've ever actually tried is the Daisy perfume (and btw- a perfume for your personal bday gift every year is a great idea :) because my sister has it! It smells great and I will add- it makes such a cute addition to a vanity/dresser. Otherwise, such a cute make-up pouch (and you can never have too many of those!!) and I've never tried a lip crayon, but I'm definitely interested!